Ever hear anyone say that the universe gives you just what you need? I have. I’m sure I’ve even said it from time to time. When Sea of Change Trading Company offered me some of these snacks to try out, I was initially pretty excited. I was also a bit dubious though. Knowing that seaweed is a nutritional powerhouse, I’ve made several (mostly unsuccessful) attempts at adding it into my diet. Sushi was about the only way that worked for me. 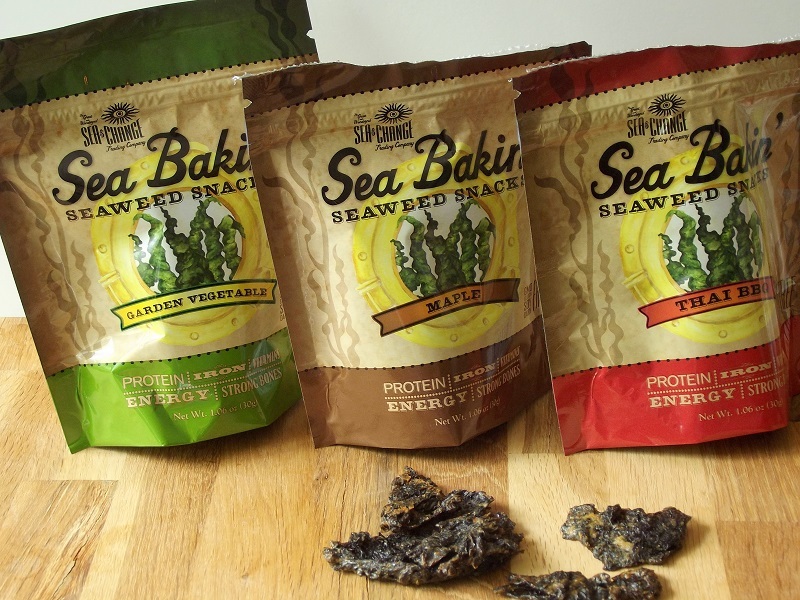 So my first thought in response to Sea Bakin’ was that they must be like those nori chips that I did a terrible job with and didn’t enjoy at all. I was so wrong though! When these chips arrived I popped open the bag of Thai Barbecue flavor, intending to do just a taste test, and ended up polishing off the whole thing. They were delicious! The Thai Barbecue are still my favorite flavor, but now that I’ve also gobbled up the bags of Garden Vegetable and Maple, I can vouch for their tastiness as well. My relationship with seaweed will never be the same. Anyone that knows me knows I’m a huge fan of hot, sweaty yoga. A few years ago I started noticing backaches in the summertime (when the yoga was extra sweaty). Maybe I’m a bit dense, but it took me a while before I realized the problem was with electrolytes. I eventually started working more potassium-rich foods into my diet, like bananas, particularly during the summer when the sweating and in-turn electrolyte loss was at a max. 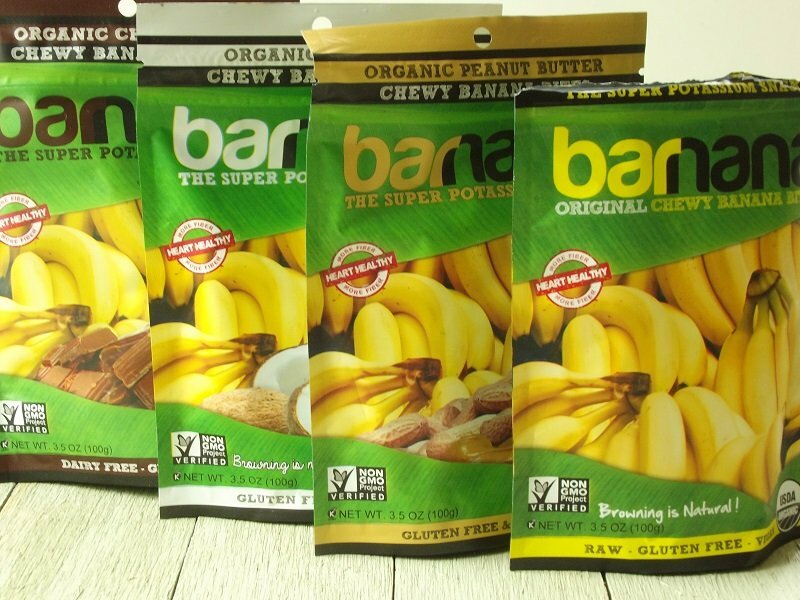 I was pleased, this summer, to receive an offer to try out potassium-rich Barnana snacks, which are made from bananas. The first thing that amazed me about these was that each little bag contains 3 or 4 bananas! Those 3 or 4 bananas are easy to down, as the snacks are delicious. The banana and coconut flavors are akin to fruit snacks (the kind made from real fruit), while the peanut butter and chocolate flavors are more decadent, and rather addictive. I received another great source of electrolytes in the form of Cocozia coconut water. What I love about coconut water is that it’s a natural, light but flavorful drink that replaces electrolytes and water lost during my sweaty yoga sessions. 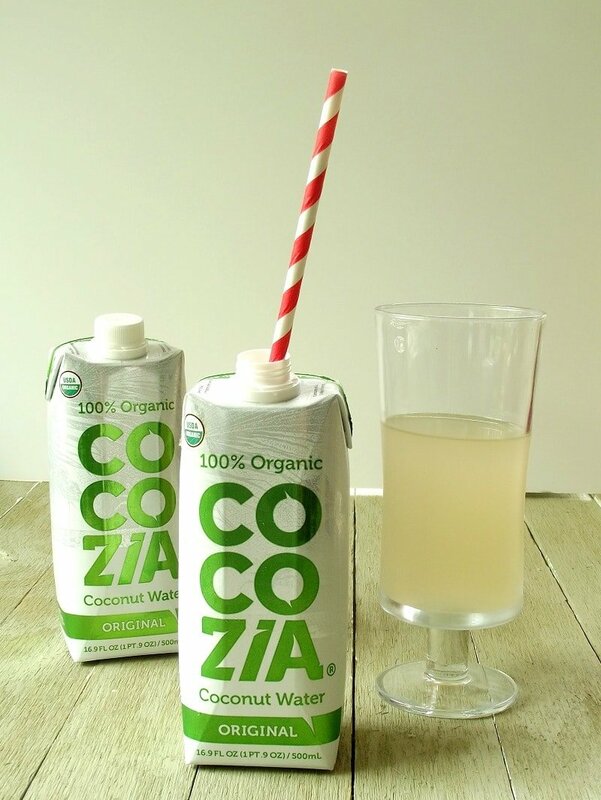 What I love about Cocozia is that it’s organic, contains a single ingredient (you guessed it: coconut water), and tastes great. If you’ve never tried coconut water before, you can expect a drink that’s light, mildly coconutty, and ever so slightly sweet. If you have tried coconut water before, you’ve got an idea of what to expect, but when you try this brand in particular I think you’ll find it to be one of the most crisp and refreshing varieties you’ve ever tasted. Green tea is another product that I try to consume regularly, though I more often brew it from a bag. There’s all kinds of buzz surrounding this brew for the health benefits – anti-cancer properties, weight loss, clear skin. All of these are great, but really just an incidental benefit of what I consider a delicious hot or cold drink. 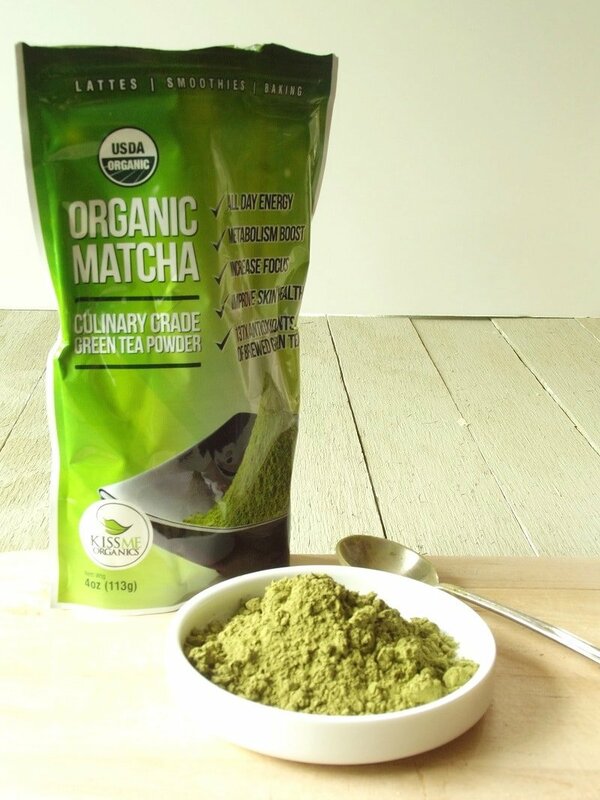 I’ve only just started working with matcha – a Japanese form of powdered green tea, so I was pleased when Kiss Me Organics offered me a sample of their brand of matcha. I’ve been enjoying mixing the powder into my hot and cold brews for drinking and found it to be great! The flavor and aroma of this blend are perfectly light and earthy – something any green tea drinker will find pleasing. I’m looking forward to playing around with some baked goods with my matcha – stay tuned. This wasn’t something that was sent to me for free, but that makes my finding it no less serendipidous. My boyfriend makes frequent suggestions of things for me to veganize, and scrapple is was one of those things. In this case I could’t do much, having no clue what the stuff tasted like and honestly not having scrapple high on my vegan wish list (just based on the idea). 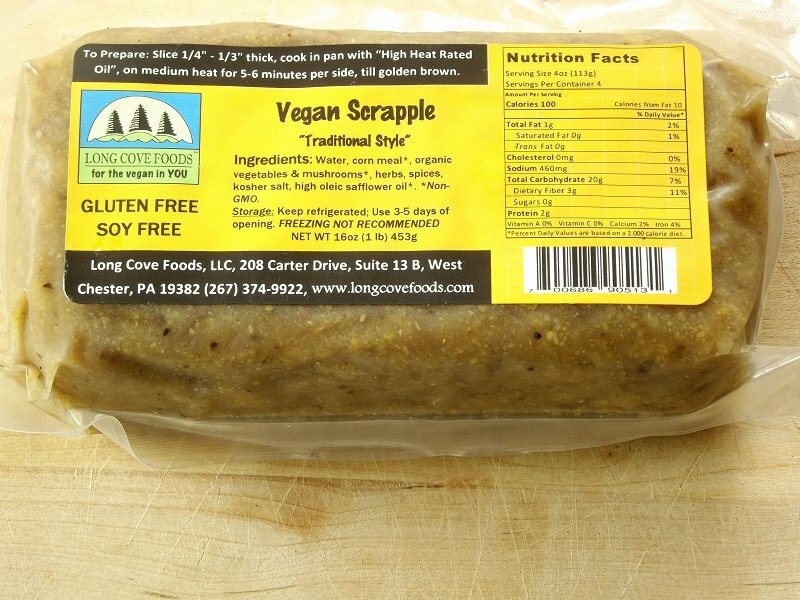 We were offered a taste of Long Cove Foods Vegan Scrapple a few weeks ago when strolling through our local health food shop. This vegan scrapple is made from polenta and mushrooms, which, despite never having tasted scrapple before, oddly made sense to me. In any event, this stuff is delicious. I fed it to a brunch party formed of a mixture of herbivores and omnivores last weekend and everyone loved it. I’m looking forward to buying another batch so I can try out the “Warm Vegan Scrapple & Roasted Exotic Mushroom Salad with Apple Cider Pear Vinaigrette” recipe on Long Cove’s website. 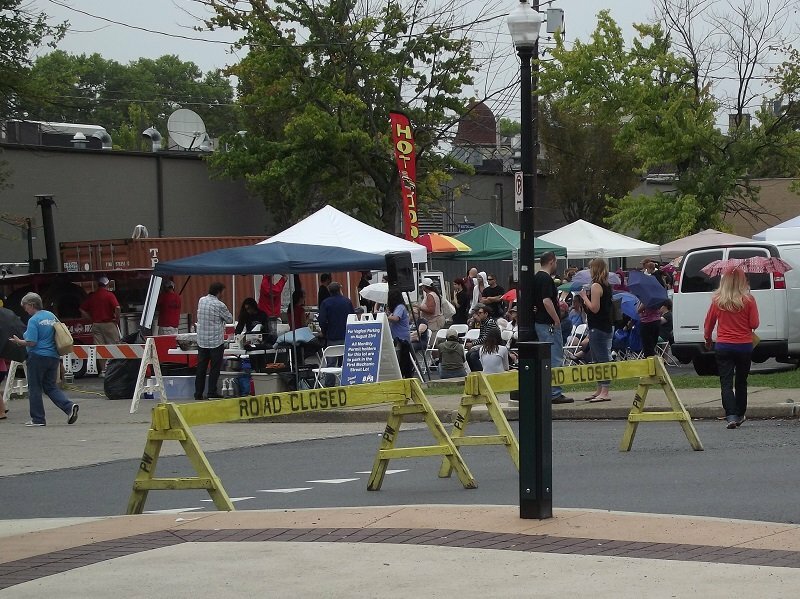 I was pretty excited when I discovered my area has a local day-long vegan festival. Bethlehem VegFest was just yesterday, and despite threatening skies and periods of light rain, my boyfriend and I did manage to make the rounds. If I’d planned better I would have eaten nothing all day until arriving at the festival, because you can seriously fill up on free samples alone. Beyond that, there were vendors with vegan pizza, hot dogs, and some of the most gorgeous baked goods I’ve ever seen, among many, many others. We did make a few purchases and I’ve shared my thoughts on them below. How cool is it that people are building businesses on completely vegan ice cream?! Of course when I saw one of those businesses represented at VegFest I had to make a stop. 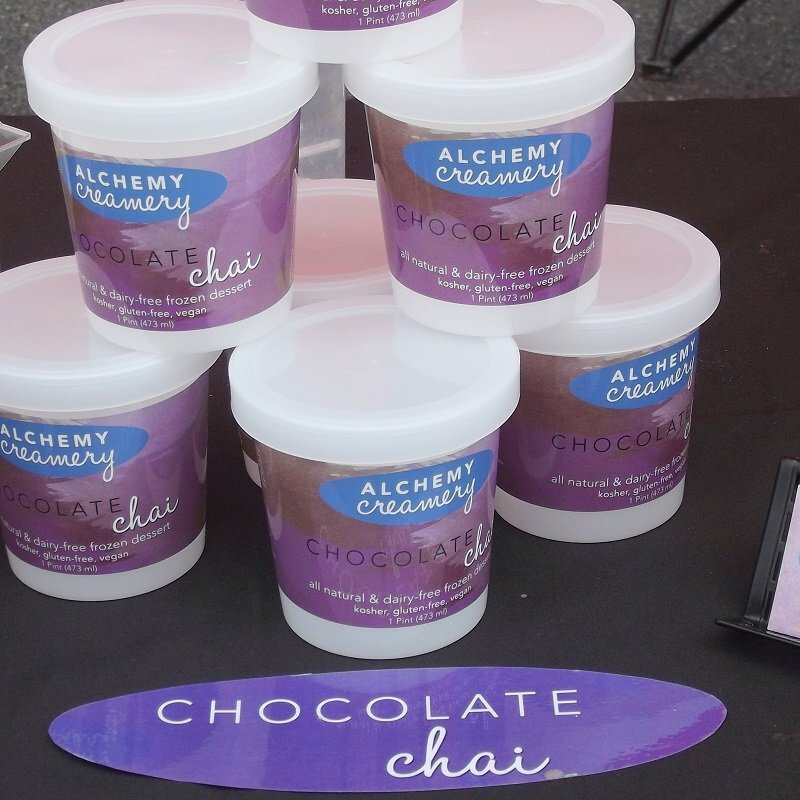 Alchemy Creamery makes delicious frozen treats out of coconut milk, almond milk and hazelnut milk. I found this out after downing a cup of their Chocolate Chai flavor, and my response was, “Of course, no wonder it was so good.” They’ve also got a bunch more flavors and I would’ve tried them all if I could have fit them in my belly yesterday. These guys are based out of Long Island. 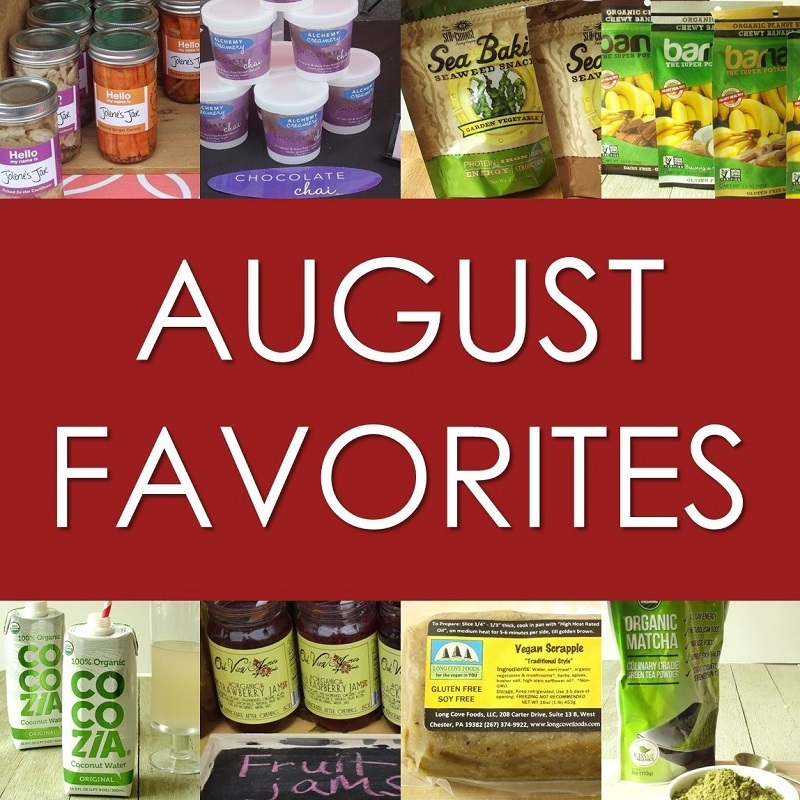 All I can say is I hope they’re very successful – which isn’t entirely unselfish as I’d like to see their products get in with some Southeastern Pennsylvania retailers (so I can eat them – in case you didn’t get that). 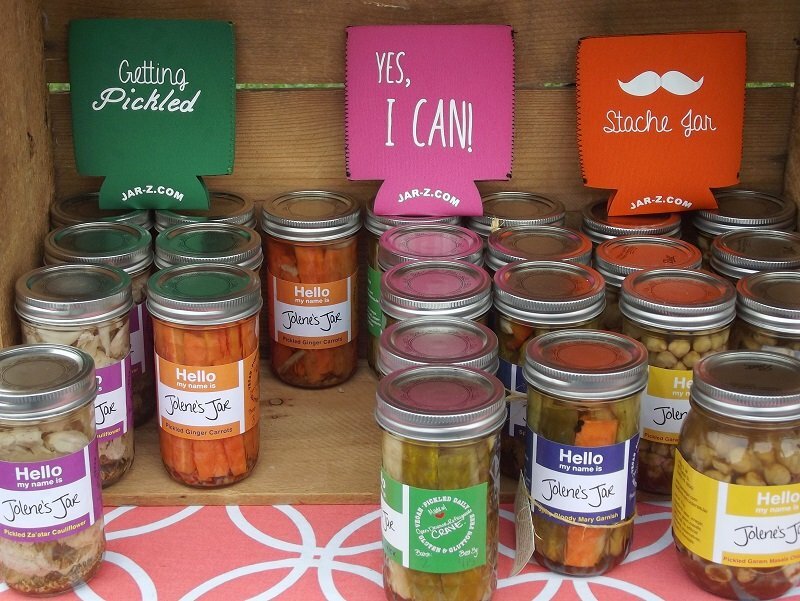 I’m a pickle lover, so I had to stop by the booth where Jolene’s Jar was selling all kinds of veggie pickle creations. I loved the creative flavors that were offered, but my absolute favorite was the Za’atar Pickled Cauliflower. I had to buy some, not only because it was delicious, but also to be polite because my boyfriend and I nearly cleaned Jolene out of her samples of this flavor. We got a hankering for more on our way home and busted into the jar while still in the car. Fortunately the boyfriend keeps plastic cutlery in the glove box. The rest is going right onto a big salad. Maybe the whole jar at once. Our final purchase of the day was made from Pure Sprouts, a local and organic food delivery company. I try to support local food producers and love eating organic, so this idea completely appeals to me. 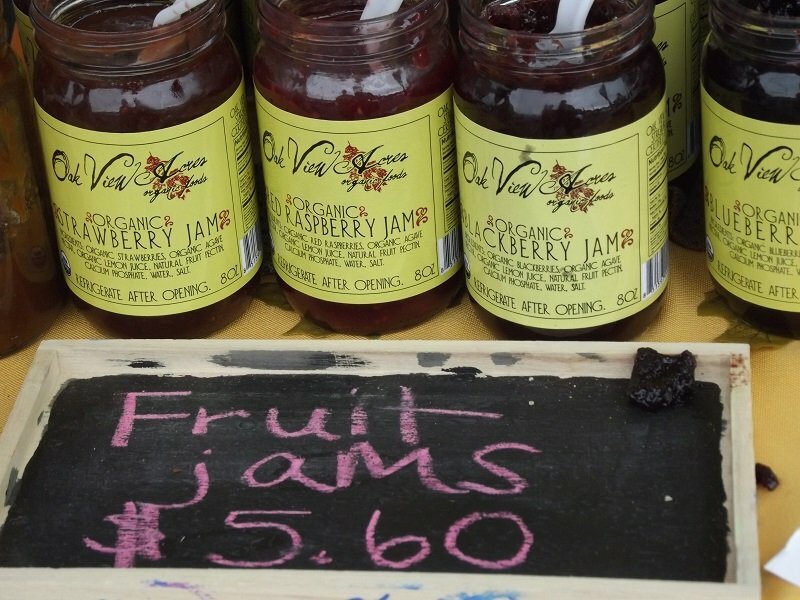 What drew us to these guys, however, was their selection of fruit butters and jams, all of which were supplied in copious amounts in sample form. I’m a sucker for fruit butter, and amid my taste testing frenzy, I repeatedly returned to the Peach Butter from Teprovich Farm. I bought a jar to bring home with me, but it’s good to know I can buy the stuff online, because I can pretty much guarantee I’ll want more of it.